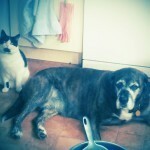 We are very surprised at how much the Husse Senior kibble has made a difference to Pepper. She is more lively and less lethargic, even the vet says he is impressed and amazed that diet could have made so much of a difference. We are so pleased and she is gleaming. 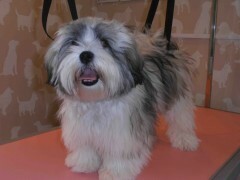 I opened Happy Tails Grooming in Basingstoke in August 2012. I have a massive love for dogs owning 6 myself. I searched for what was the best of everything for them including what I feed them. My business took off so quickly, now having over 600 clients. I was approached by Janet a Husse Franchise owner who explained to me about the company and its products. I looked into it through their website and information given to me and loved what I was reading. I then went with Janet to the head office for a training and info meeting, it just got better and better I couldn’t believe how amazing all the products are. I took some samples to try with my own dogs as I could not ask any of my clients to try these amazing products unless I believed in it myself. Well my dogs loved them I could see a difference in their coats and behaviour after a matter of weeks. So I signed up as an agent for Janet showing off the products to my clients. Many of my clients agreed with me that their own dogs health was looking so much better I even have a client who’s dog was a little over weight, she took a sample and the dog loved it. Janet went to see my client and put the dog on a weight management plan with Optimal Light, going to my client and weighing the dog every couple of weeks and the results have been amazing. Not only was the dog losing weight at a healthy pace the coat and skin of the dog also improved. The dogs that come to me with sensitive skins and irritations have tried the sensitive range and the dogs skins and coats have improved too. As a professional groomer it is important to me that the dogs and cats I groom are in peak condition and I can honestly say Husse has a product for everything my dogs love it, my clients dogs love it. We are very happy with how Skittles our J. Russell is looking and behaving. After having an operation and being on steroids for a while, she is now swiftly losing weight on the Husse Senior Mini; regaining her confidence and vigour. We have had many compliments including the vet and groomer praising her improvement.